Natural herbal product. Contains Lactic Acid. Maintains pH balance. Suitable for all skin type. Paraben & Soap free herbal formulation. 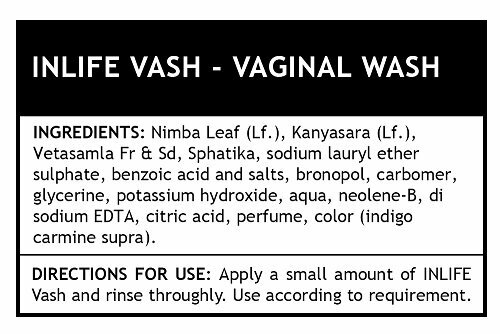 INLIFE Vash (Vaginal Wash) is exclusively formulated to Neem, Aloe Vera and Lactic Acid. It helps to maintain ideal pH level of 3.5. Pour a small amount of Inlife Vash on your hand and apply it on your external intimate area during a shower. Rinse thoroughly with clean water and dry as usual. Make sure your Feminine Hygiene Wash is very gentle and has natural ingredients.